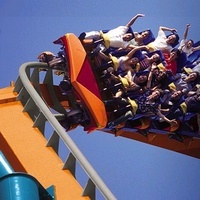 Six Flags Over Georgia has just about every kind of ride for every kind of rider. From towering coasters like the gravity-defying ride "Goliath" to family-pleasers like a classic carousel, they've got you covered. In addition to the most thrilling rides on the planet, you'll find a wide variety of top-shelf entertainment in shows and events at the park. Parking: One-day parking is available for $15 in lots at the park.